Strings 3 top finished - finally! This top took me forever. Well, not forever - as that's a long time. But quite a while. I felt like I never really "got into" doing this one. I tried to grind my way through, but in the end, I had to force myself to make those blocks on the weekends. Yeah, there were many weekends, I just tried to block out working on these blocks - like a bad project you just keep procrastinating about. However, because I had made so many crumb blocks lately, that making string blocks, even though I wasn't excited about the pattern, were so much faster than those crumbs blocks, that I managed to do make myself do them even if in baby steps. However, I did finally finish it this past week! And I am so glad it is done! These strings and crumbs tops. I've not written up patterns for them yet, but I do plan to - especially when I run out of other things to do. This one was not super easy to do since I started with strings blocks that required strings to be put on a square up and down and not diagonally - so I needed a bunch of about 11" long strings. The advantage of using strings that are diagonal is that you can use pieces that are all different lengths. That is very helpful, let me assure you. But I needed to try it at least once. I will go back and write this one up, however, so we have it all in one place. I should have that done by the time I show the final quilted quilt! One of the reasons that this one took so very long to finish up - I started making these blocks almost a year ago now as I finished the first few on September 3, 2017 was because I couldn't decide on how to use the blocks! I kept playing with different plans, but nothing struck me as worth making until relatively recently. In the end, yes, I am pleased with the layout I decided on. I think the little red cornerstones are perfect and "make" it "click" for me. Once I finished the blocks themselves, putting it together went together relatively quickly. Do you like strings yet? Answer - "Not really - that's not how I'd describe my relationship with them. I see them as fabric that I have that either I bought or someone gave me - which they bought. It represents $ to me, so I would like to make something nice out of them if at all possible rather than have them end up in the garbage or kindling bags." Can you tell any difference in how many strings you have? Answer - "Yes, a little. I can tell I have used up some - especially the brights. 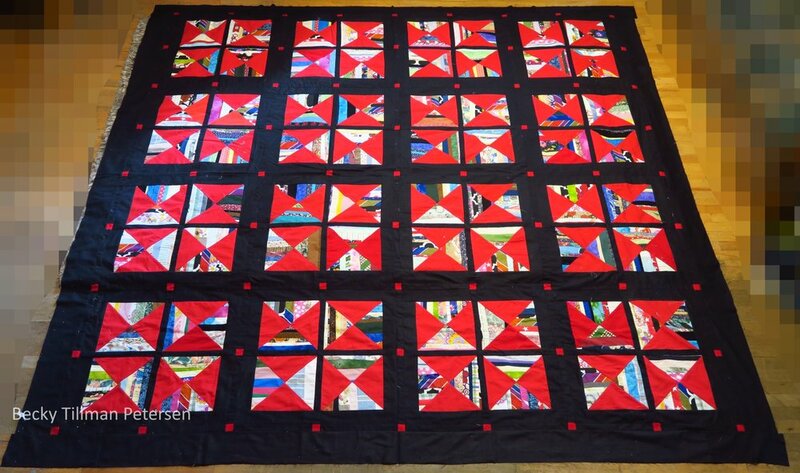 I think I need to plan a strings quilt using a lot of lights as brights make very interesting ones but the lights are harder for me to use." 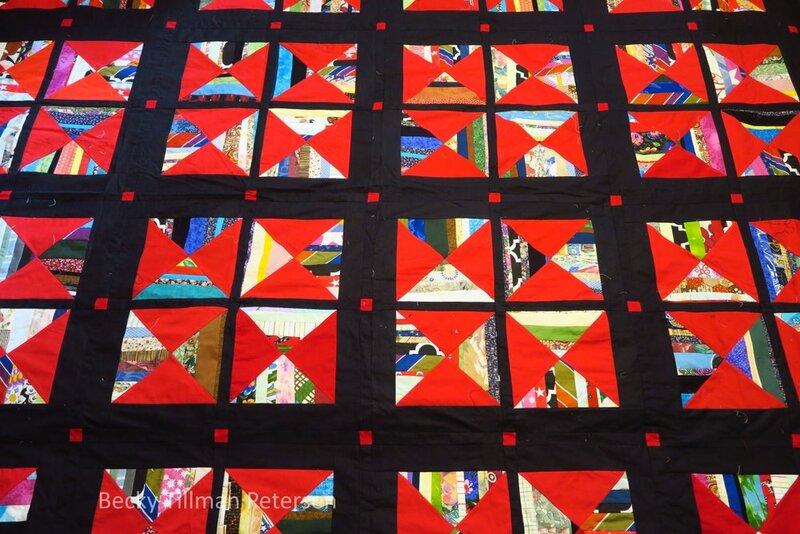 And that's what's been happening from my part of the world - at least with regards to quilting! Be sure to check out what my sis has in the store!